When thinking of double glazing your sash windows, it is a good idea to overhaul and weatherproof the existing sashes to further improve the insulation. Double glazing will also require some adjustment in the case of window weights and fitting to sashes and case. The units will be roughly twice the weight of the original glass and will need to be counterbalanced with additional weights. 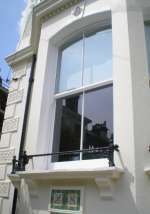 Estimates for this work will vary quite considerably, but as a rough guide, the cost to renovate, draft proof, and double glaze a sash window with Slimlite may range from between £770-£1380 plus VAT depending on requirements.